The diocese is blessed with six religious congregations and organisations offering retreats (individual and group, or for parish groups), prayer, spiritual direction, and opportunities for taking time to reflect and pray within a supportive community. Getting away from the busyness of everyday life and immersing yourself in a quiet environment can provide the ideal environment for you to really focus your attention on listening to God. Below is a list of retreat centres in the diocese including links to their websites. Set on 16 acres of lush countryside in Bowral, Harter Park is in a world of its own and is renowned for providing a tranquil and peaceful escape. Groups and individuals from all walks of life are welcome and accommodated at Hartzer Park. Set in semi-rural surroundings in a peaceful setting, Mount Carmel Retreat Centre—under the auspices of the Discalced Carmelite Friars—is a place for individuals and groups to get away from the stresses and strains of modern day life and develop their spirituality by means of retreats, conferences and study groups. The Hermitage offers retreats for those seeking some time in prayer. Accompaniment or Spiritual Direction is available for retreatants, or guests may choose to take some time for a private retreat. Catering or self-catering is available. Just minutes away from Wollongong's most glorious beaches, The Venue is perfect for sporting groups, family reunions, youth weekends, school retreats, leadership and team building programs and church groups. 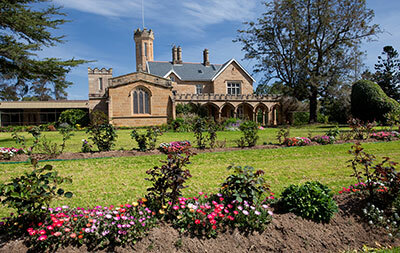 Set in the escarpment surrounding Jamberoo, The Abbey offers a place where people can find peace through silence, nature, open spaces and prayer. Hospitality is a Benedictine charism which enables the community to share the monastic life with guests who come to the Abbey seeking God. Set on 500 hectares of natural bush land, St Mary’s Towers is home to a way of life. In keeping with the charism of the Missionaries of the Sacred Heart, it is steeped in a spirituality of the heart. This creates a beautiful and peaceful environment with a supportive and praying community for anyone seeking to relax and enjoy communion with God.